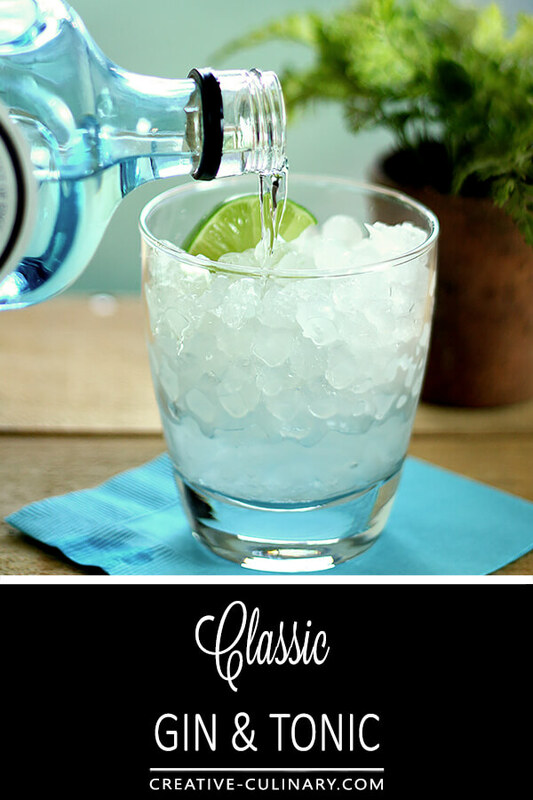 I’m not sure any cocktail quite embodies summer for me than a Classic Gin and Tonic; they are the epitome of cold and refreshing and so easy to make too! I’ve enjoyed this venture into cocktail making but can I share something with you? I don’t drink a lot…no, really I don’t! I come from a family with a history of alcoholism and as a result I’m as cautious as any one person could be to be aware of my drinking habits. So…do I drink the cocktails I make for these posts? Not always. I only make cocktails that I already know I enjoy or if it’s something new that I’m happy with and consider blogworthy, then I have definitely tasted the end result but depending on the time of day, that might be all I enjoy. If they’re made later in the day and photographed I just might enjoy a tipple…but not two. Until last night. I simply LOVE gin and tonics and throwing anything with Bombay Sapphire Gin into the sink was not going to happen. Can you blame me? Despite last night’s forecast of potential snow (not all that unusual for spring in Denver), yesterday was a gorgeous spring day and I definitely think of a Gin and Tonic as one of my favorite warm weather cocktails. Light and so refreshing with just a touch of citrus from fresh lime juice, it’s just a perfect warm weather cocktail. Gin was first created by Dr. Franciscus Sylvus, a Dutch chemist, in the 16th century. Originally developed in an attempt to cleanse the blood of those suffering from kidney disorders, Dr. Sylvus named his creation genièvre, French for juniper, the primary botanical that is a part of the distilling process. When King William III used his grudge against France to ban expensive liquor imports from there, mass production of gin in England made it affordable and that made it easier for the Brits to deal with the ban. Gin is a light-bodied liquor made of a mash of cereal grain, typically corn, rye, barley and wheat. The main flavor and aroma notes are still contributed by juniper berries. Different gins use their own variety of additional botanicals; for the Bombay Sapphire Gin used in this cocktail, those include almonds, angelica, lemon peel, coriander, liquorice, cassia bark, cubeb berries, iris root, grains of paradise and of course, juniper berries. Manufacturers cannot, by law, qualify their gin by age. Because this is a very simple cocktail; the type of gin that is used can make a huge difference. 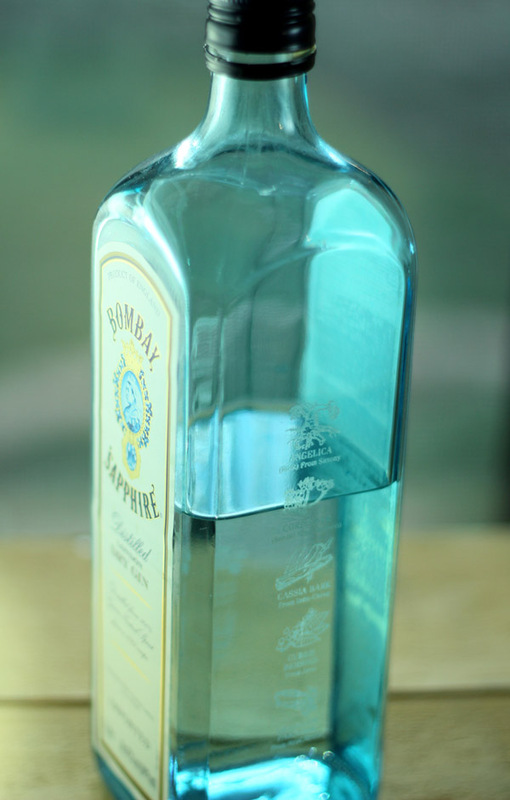 I noticed one writer say it was NOT the drink to use Bombay Sapphire for…but that is personal preference as I prefer the less dry and more floral notes; so use what YOUThe gin and tonic actually came about because of malaria. Centuries ago, when malaria was a problem in warmer climates, quinine was used to treat the disease and tonic water was developed as a vehicle for the quinine. In the 18th century, tonic water contained a large amount of quinine resulting in a bitter taste and gin was added to make it more palatable. Since it is no longer used as an antimalarial treatment, tonic water today is usually sweetened and contains much less quinine and as a result is much less bitter. Like the gin; using a quality tonic water does make a difference; I know, I’ve tried using cheaper store brands but the truth is I prefer Schweppes. Some may scoff at it’s use, but I like that I can serve this cocktail with a sugar free version as well. For friends serious about cutting those corners, it allows them to enjoy a cocktail with me and for that I say…Cheers! A classic and rightfully so; a simple and refreshing cocktail for summer. Pour gin over ice and squeeze the juice from one section of lime into glass. Fill with tonic water, stir and garnish with another lime quarter. I don’t recall that I do Nina…if something comes to me I would be happy to help but just doesn’t ring a bell. I rarely drink cocktails but I think this is a perfect choice when we have guests. I am sure they will love it. P.S. I can’t rate the recipe, something is not working. 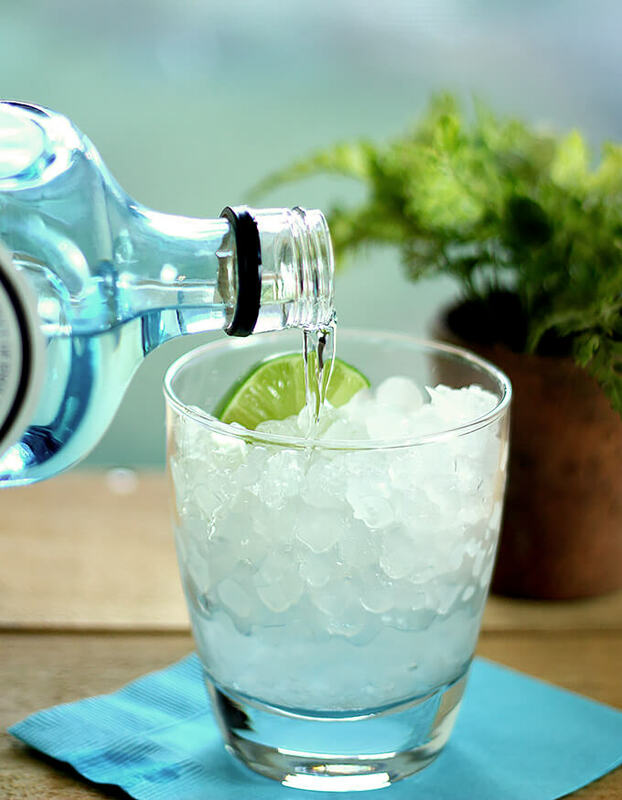 I love a good G & T, and Bombay Sapphire is definitely my choice when it comes to Gin. I just love the floral and herbal quality of it. I think it just gives it more depth and interest. I saw someone somewhere lambast it as too floral. For him maybe…for me, I love that quality about it! Oh man you have no idea how much I love gin and tonic! Have you ever had Blue Magellan gin? It’s soooooooo good! BTW where do you get that popcorn ice? Do you make it? I have not…sounds like I should try some huh? I wondered if you got it from Sonic! I kept thinking “man that looks like the ice from Sonic”….haha. I’m going to see if I can get a bag. Love the popcorn ice! Oh and definitely pick up a bottle of Magellan. You will not be disappointed! My tipple of choice for a hot summers afternoon. I would never throw it down the kitchen sink no matter the time of day I was photographing hehe…and I also don’t drink much. I love a dry gin and tonic, usually with lemon because limes are so incredibly expensive here but I recently was encouraged to try something new and I have not gone back to the lemon. So I am going to encourage you to try it too Barb…. ice, gin, tonic, splash of Angostura bitters (just to turn it lightly pink) a pinch of good quality salt flakes (just throw it in and it will settle on the bottom and slowly dissolve, and some very thinly sliced cucumber. My word…..stunning it is! Cheers! Wow; I’ll take your word for it and will have to try that. Sounds like a great twist on this classic Colleen, thanks. And to you too Karriann! How perfect is this right NOW! Barb, I literally just got back inside. Not complaining about the warm, beautiful weather we are having though; however, this will make my morning better. Well, it’s almost lunch, and G&T is my kind of thing. REALLY! Thanks for sharing. Will have go out in the garden to get limes! It is perfect isn’t it Annapet? Despite the fact that gin really is alcohol…the drink still is not overly boozy and seems to hit the spot most on those warm sunny days that a heavier bourbon cocktail would not. Now if I only had a lime tree! How did you know that G&T is most favorite cocktail ever! It just tastes like summer to me. Just added tonic to my weekend shopping list. Seems it’s a favorite of lots…and rightly so. Crisp and clear…it really hits the spot in summer doesn’t it Lana? I was schooled in the making of gin when I visited the 303 Distillery last year Winnie and was unaware of just how unique each can be depending on the botanicals that are added; so often if you had gin you didn’t care for, there is a chance another brand might better suit your palate. Thanks for your sweet compliment; I have found my own personal journey into doing this weekly post has been enhanced by discovering the history of the cocktails I’m doing. Not that I’ll never do a ‘flavor of the month’ but I’m thinking this is my forte for sure. A classic and for a very good reason!! This was the “summer drink” staple of my family growing up and the first “true” cocktail I ever tasted! Still one of my favorites today – simple and classic! Ah, yes photographing a cocktail at 10am has led to some “waste” around here too!! Like you, I am not a huge drinker and rarely have a drink before “cocktail” hour!! Gorgeous photos Barb and a fun history of the G and T!! I KNEW you would understand! Now if I could get my act together and always shoot them at the perfect time, I would have no problem with an evening cocktail during the week, but that seldom happens and besides…I don’t like to drink alone! Again, another reason we should be closer! That looks delicious. I have to say I’m not a really big drinker myself (although I do love a good glass of wine) and part of that is due to my first boyfriend being an alcoholic. I can get a little paranoid when I think my husband is drinking too much but I try to get better at that. Lol.. I was just in a cocktail shoot this week so funny that you post this delicious looking drink now. Looks perfect for hot summer! I suppose at my age I could quit worrying; if I had a tendency towards having a problem I would certainly have show a proclivity by now, right? So part of it is probably some paranoia that I should let go but I’m OK with being cautious; I was and remain determined to never re-create some of the scenes I dealt with growing up with an alcoholic parent. Gin and tonic was my first ‘cocktail of choice’ after turning 21 and always seems perfect when the weather turns warm. Love all the history Barb and of course who can resist the blue bottle (though I’ve migrated to Rob’s Mountain Gin to stay true to my locavorism). Great post! I would have loved to have used Rob’s Gin for this post but…none in the house and so here we are (though you did remind me to mention them, at 1am I was just so ready to hit ‘Schedule’). I’m planning on doing a cocktail as soon as I get my hands on a bottle; love supporting their stuff too. Cheers to you for another wonderfully written and photographed cocktail post complete with a very informative and interesting history of Gin as well. I did not set out to do this but I’ve enjoyed pulling the history into a cocktail if I can. I must say…glad I can enjoy a G&T without the side requirement of malaria! I’m not a gin lover but gladly swap it out for vodka with my tonic for my favorite summer cocktail. Heck, why wait for summer?! I hope that that would have medicinal values as well because I definitely feel much better after having one or two. Hehe…yes you made me chuckle at the notion of using them for medicinal value; isn’t that the truth! Your posts are so educational! Love it. Funny thing about blogging how things come about that we didn’t plan. I shared the history of a drink once or twice and everyone seemed to love that information so now I’m learning towards including drinks not because they are the most popular fad but because they are classics and have a history I can share with readers. I knew about quinine to treat malaria but I never knew that this drink came about as a result of that treatment! Your little history lessons are always really fascinating so yay for you and your cocktail posts! I think the only time I drank gin was in Nigeria… but that’s another story. I am not a drinker at all but all of your cocktails always look refreshing and delicious! Maybe I need to drink them with you? I seldom drink alone so yes…we need to get together and sip a few. We could even make up our own concoction…something very Franco American! Now that would be fun wouldn’t it? I love Tanqueray too…so added it to my post this morning!